Teeraina in October 2006. North is on top. Notice the lake covering the southeast region of the island. The prevailing ocean current runs roughly left to right. There are two dirt roads around the island's perimeter - an outer (Beach Road) and an inner one (Ring Road). Transport inland is done by boat on artificial canals, rather uniquely for a Pacific island. A 21 meters (69 feet) navigation light tower and two radio masts stand near Tangkore. What cannot be produced locally is shipped in about twice a year;  there is also some minor inter-island traffic by ship or boat. 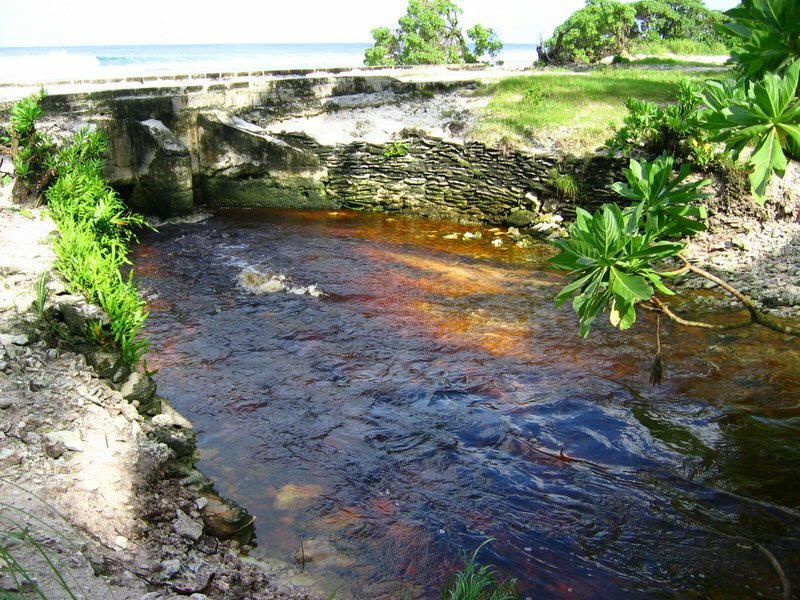 The old landing was at the western tip, but this was dangerous due to being exposed to surf breaking on the reef flats; it has been more recently replaced by a new and more easily accessible landing south of Tangkore, where the canal system feeds into the ocean. A rough airstrip of some 1,000 meters (3,300 feet) length exists near Kaaitara. It may become temporarily unusable after heavy rains. In 1798, Teraina was not settled, and definite remains of prehistoric human settlements (as opposed to simple human presence) were overlooked. It was only later that the remains of coral marae platforms were identified. There are other strong indications (see below) that there was at least a minor and temporary presence of Polynesian seafarers, which arrived probably from Eastern Polynesia and maybe from the Society Islands, before Western contact. Gilbertese may have also had a temporary presence, but this is unlikely as the island was not on one of their major trading routes, and due to the prevailing westerly winds and currents, getting back to the Gilbertese heartland would have been almost impossible. Teraina was sighted on 12 June 1798 by the American whaling captain Edmund Fanning of Betsy; he named the island for George Washington but did not attempt to land. 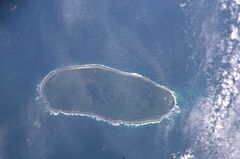 The island was subsequently claimed under the Guano Islands Act of 1856 for the United States under the name "Prospect Island". Guano was never mined or exported to any notable extent, however; the humid climate prevents the formation of substantial deposits. It was occupied by Captain John English and people from Manihiki in about 1860. It was annexed by the British by Commander Nichols of HMS Cormorant on May 29, 1889. It became a part of the Gilbert and Ellice Islands colony in 1916. The name of the island was changed to Teraina in 1979 when Kiribati gained independence. The major export of Teraina is copra, the dried meat of the coconut. Teraina in April 2006, SSW on top. Note flooded bogland in west (right) part of island. Ecologically, Teraina is also highly interesting, for several reasons. First, as is readily apparent from its peculiar geographical and geological features, it possesses a combination of ecosystems that is quite unique in the entire world. Second, it holds the world's largest population of a rare bird species though it is over 2,500 km (1,600 mi; 1,300 nmi) from that bird's original home. Furthermore, it was until fairly recently home to some enigmatic dabbling ducks which are now extinct. Last, the island's biodiversity seems to prove quite conclusively that, probably by about 1200 AD or so, the island was temporarily inhabited by a significant number of humans. At present, there is no formal protection for the islands' ecosystems or species, but it has been suggested to legally protect key habitat, namely the boglands. Though it is globally endangered, the Rimatara lorikeet (Vini kuhlii) does not appear to be in need of formal protection;  it actually benefits from human land use change and the feral cats. The former provides the birds with more habitat, while the cats have so far managed to keep Teraina completely free of black rats (Rattus rattus) which due to their tree-climbing habits would seriously jeopardize the species' existence, should they become established in numbers. Given the negative experience e.g. from Rennell Island, maintenance of a vigorous tilapia fishery would seem to be advisable. These fish certainly represent a valuable source of protein on Teraina, and in fact were originally introduced for that purpose. Red-footed boobies at Palmyra Atoll, Teraina's neighbor island. Though numerous seabirds nest on Teraina, for many such species the limited habitat makes it a less important rookery than other, similar-sized raised atolls. 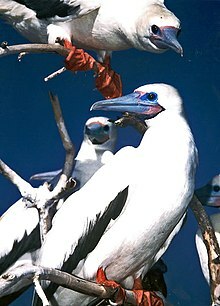 About 10 species of seabirds breed here, most significantly tree-nesters like the little white tern (Gygis microrhyncha) and the red-footed booby (Sula sula). The eastern reef egret (Egretta sacra), widespread throughout the region, can also be found on Teraina. Among migratory birds, the ruddy turnstone (Arenaria interpres), sanderling (Calidris alba), bristle-thighed curlew (Numenius tahitiensis), Pacific golden plover (Pluvialis fulva), and grey-tailed (Tringa brevipes) and wandering tattlers (T. incana) use Teraina as stopover location or winter quarters on a regular basis. Other shorebirds, gulls, and occasionally ducks of North American and East Asian species may occur as vagrants. In historic times, two species of landbirds and one subspecies of duck have been recorded. The latter, Coues's gadwall (Anas strepera couesi), was the only distinct subspecies of the widespread gadwall. It is surrounded by considerable mystery, mainly as regards the origin of the population, the age and therefore validity of the subspecies (it is sometimes disputed to be significantly distinct), and the causes and date of its disappearance. Only two specimens are known - a couple that is not fully mature, and therefore only limited information can be gleaned from it. What is certain is that there was a duck population of some size in the mid-1870s,  while in 1900 all were gone. The bokikokiko (Acrocephalus aequinoctialis) is Kiribati's endemic reed-warbler. This small greyish passerine is well-known, due to its bold and inquisitive habits, and its song, a series of alternating higher and lower squeaks after which it is named. As with most outer Pacific islands, there are no native land mammals. Polynesian rats ( Rattus exulans) are present on Teraina,  apparently since prehistoric times. They may have arrived with flotsam after storms further west, or accidentally or deliberately (as food) been introduced by prehistoric seafarers. Their present-day impact on the bird population is minor, but if rails were once present on Teraina, the rats had probably some role in these birds' disappearance, and maybe in that of any other birds gone extinct in prehistoric times too. If a Prosobonia sandpiper once bred on Teraina, it is almost certainly those rats that are responsible for these birds' disappearance; only a single taxon of Prosobonia remains today, precariously holding its own on atolls that are devoid of any rat species. The widespread marbled eel is also found in Teraina's lake. Feral dogs, cats and pigs occur in varying numbers on Teraina; the cats especially are responsible for some decline in the number of ground-nesting seabirds. On the other hand, as noted above, the cats have thus far kept the rat population at bay. Lacustrine species reported from Teraina include fish. and some unspecified " shrimp",  i.e. (in all probability) a member of the Crustacea. Teraina's freshwater fish include the marbled eel ( Anguilla marmorata), a Caranx freshwater trevally, and Oreochromis tilapias and the milkfish ( Chanos chanos). The latter two, and perhaps also the trevally, were introduced in recent times. 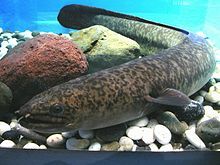 The eels were already established by 1877;  like many Anguillidae they are catadromous and able to migrate some distance on dry land. Thus it may be presumed that the lake is continuously being restocked from the Pacific, though apparently no actual field data exists on the habits of the eels of Teraina. ^ a b c d e f g h i j k "22. Teeraina" (PDF). 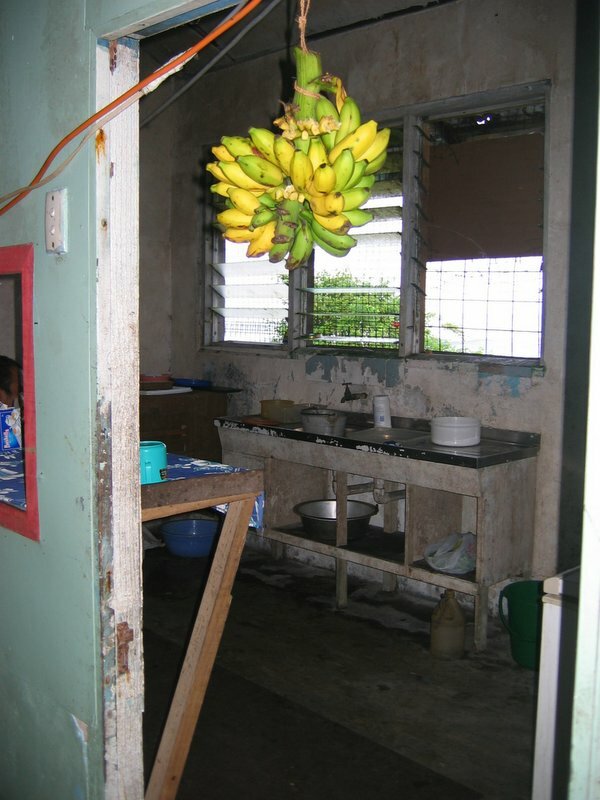 Office of Te Beretitent - Republic of Kiribati Island Report Series. 2012. Retrieved 28 April 2015. ^ Premier Postal History. "Post Office List". Premier Postal Auctions. Retrieved 5 July 2013. ^ And perhaps one of the more aquatic Porphyrio swamphens as well. This is not explicitly mentioned by Steadman but plausible, given the unique lake habitat and the former presence of Porphyrio paepae on Hiva Oa. ^ Such a bird would probably be related to the Pacific (D. pacifica)/ Micronesian imperial-pigeon (D. oceanica) group occurring to the west of the Line Islands, or less likely to the Polynesian (D. aurorae)/ Marquesan imperial-pigeons (D. galeata) occurring to the south. ^ Such a bird would probably have belonged to the sacred kingfisher (T. sanctus) group; that species today occurs as a vagrant in Micronesia, and related forms are resident in SE Polynesia. ^ This would probably have been related to the Micronesian starling (A. opaca) and the recently-extinct Pohnpei starling (A. pelzelni) or somewhat less probably to the extinct Huahine (A. diluvialis) and bay starlings (A. ulietensis) of the Society Islands. BirdLife International (BLI) (2007): Rimitara Lorikeet Species Factsheet. Retrieved 2008-FEB-24. Bryan, E.H. Jr. (1942): American Polynesia and the Hawaiian Chain (2nd ed.). Tongg Publishing Company, Honolulu, Hawaii. Kiribati National Statistics Office (KNSO) (2006): 2005 Census of Population and Housing (provisional results). 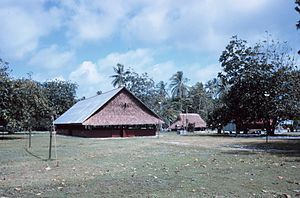 Parliament of Kiribati (POK) (2007): Constitution of Kiribati. Version of 2007-SEP-10. Retrieved 2007-OCT-10. Resture, Jane (2004): Washington Island - Line Islands. Version of 2004-FEB-08. Retrieved 2008-MAR-24. Scott, Derek A. (1993): Republic of Kiribati. In: A Directory of Wetlands in Oceania: 199-228. [ verification needed] International Waterfowl and Wetlands Research Bureau, Slimbridge, UK and Asian Wetland Bureau, Kuala Lumpur, Malaysia. Tregear, Edward Robert (1891): Kaka. In: Maori-Polynesian Comparative Dictionary: 118. Lyon and Blair, Wellington. Online version 2005-FEB-16.